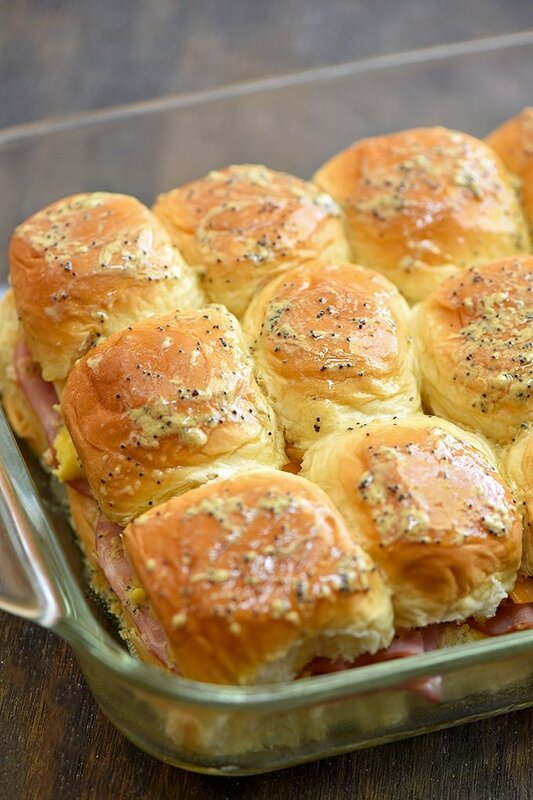 Ham Egg and Cheese Breakfast Sliders with your favorite breakfast fixings, Hawaiian rolls, and a delicious Dijon poppyseed glaze. They’re easy to make and can be prepped ahead. 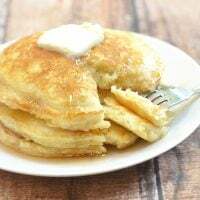 Perfect for brunch or game day! 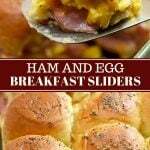 We’ve been making all kinds of sliders at home, and I decided to start a series of them here on the blog. We have a cheeseburger and Philly cheesesteak posted so far and a lot more to come! You’ll enjoy every bite of these mini sandwiches; you’ll be hard-pressed to pick a favorite! But who says we have to choose, right? 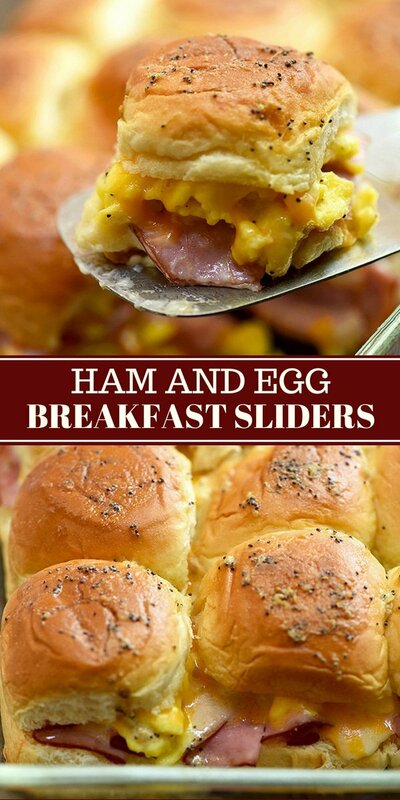 The Philly and the burger versions are great options for a weeknight dinner or game day, and these breakfast sliders are just what you need for a scrumptious breakfast or brunch! 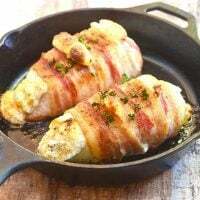 Using a serrated knife, cut a 12-count slab of Hawaiian rolls in half horizontally and carefully spread a thin layer of mayonnaise on the top and bottom halves. Place the bottom part of bread in a lightly greased 9 x 13 baking dish. 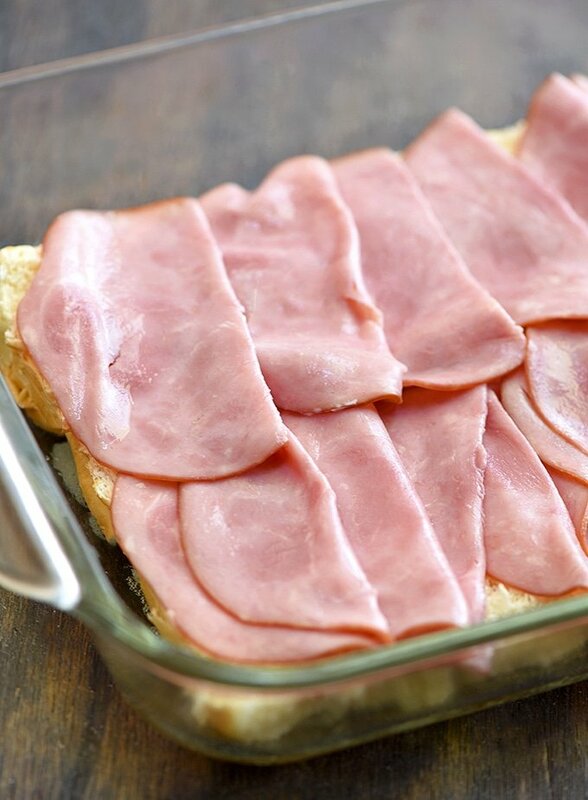 Arrange sliced ham on top of bread to cover. Not in the mood for ham? You can substitute cooked bacon or sausage patties. Spoon the scrambled eggs on top of the ham. For soft, luscious eggs, cook in the pan over low heat just until set but still slightly wet as they will continue to cook when baked. 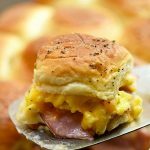 I love scrambled in these breakfast sliders but I’ve also tried layering with a veggie omelet or over easy fried eggs, and both were scrumptious! 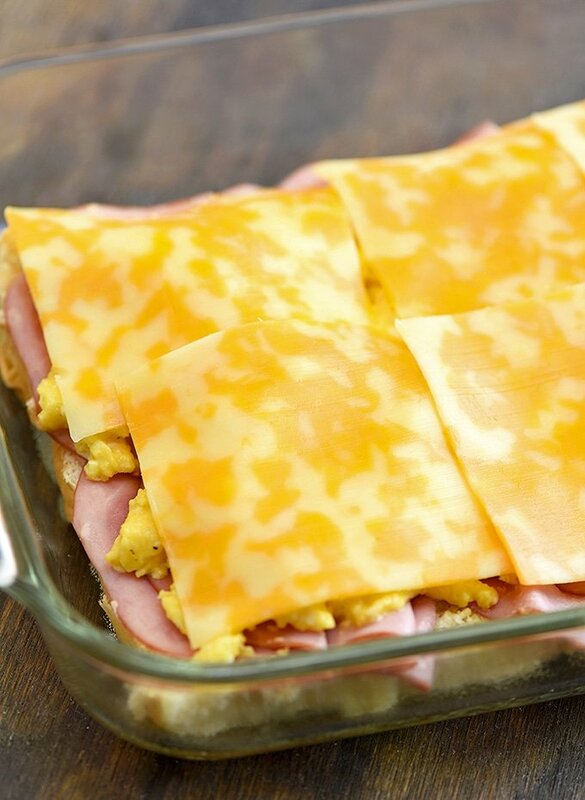 Top the eggs with cheese slices. Feel free to use your favorite; Cheddar, Swiss, provolone, Mozzarella, pepper jack or any quick melting varieties are all great options! Gently place the top part of the bread rolls over the cheese layer to cover. In a bowl combine melted butter, Dijon mustard, and poppy seeds and brush liberally on the bread. 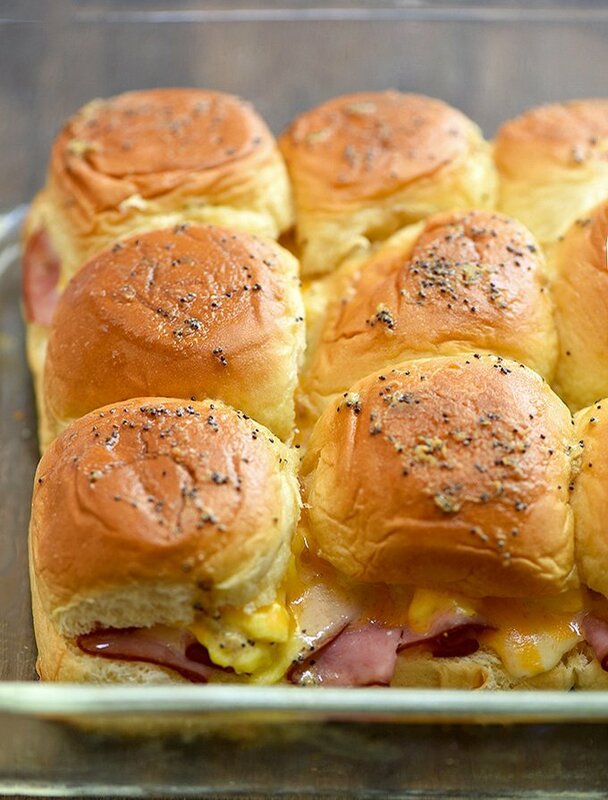 This glaze not only makes the sliders extra buttery, but it also adds a touch of color and a hint of tangy flavor which goes well with the sweet rolls and the savory ham. Cover with film and bake in a 350 F oven for about 10 to 15 minutes or until they’re hot and melty and yummy. Take them out from the oven and enjoy for breakfast, lunch, dinner or any meal in between! 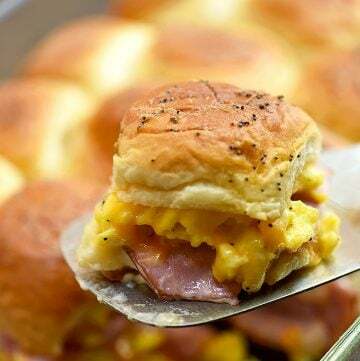 This breakfast sliders recipe is a must on your meal rotation! 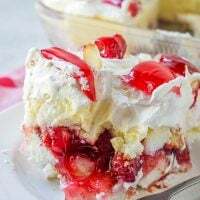 It’s ready in minutes and can be made ahead for a large crowd. So easy in fact the hardest part is making sure the eggs are cooked nice and fluffy. Enjoy! 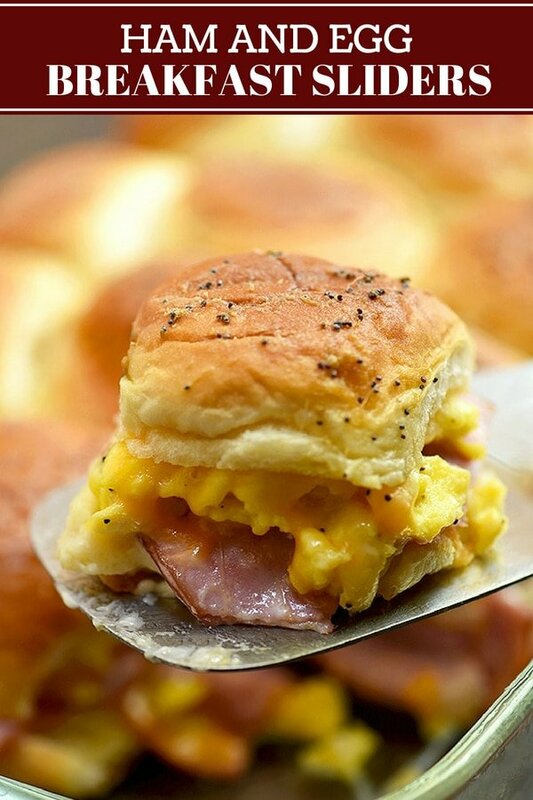 Ham Egg and Cheese Breakfast Sliders with your favorite breakfast fixings, Hawaiian rolls, and a delicious Dijon poppyseed glaze. They're easy to make and can be prepped ahead. 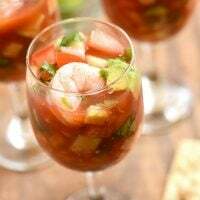 Perfect for brunch or tailgating parties! When butter is barely bubbling, add beaten eggs and allow to cook for about 20 to 30 seconds or just until they start to set. Using a spatula, swipe around the edges of the pan to create large soft curds. Don’t flip the curds over. Continue to gently push and fold the eggs to form curds for about 2 to 3 minutes or just until they're set and still slightly wet. Remove from heat immediately. Using a serrated knife, cut the rolls in half horizontally and carefully spread a thin layer of mayonnaise on the top and bottom halves. Place the bottom slab of bread in the prepared baking dish. Arrange sliced ham over bread to cover. 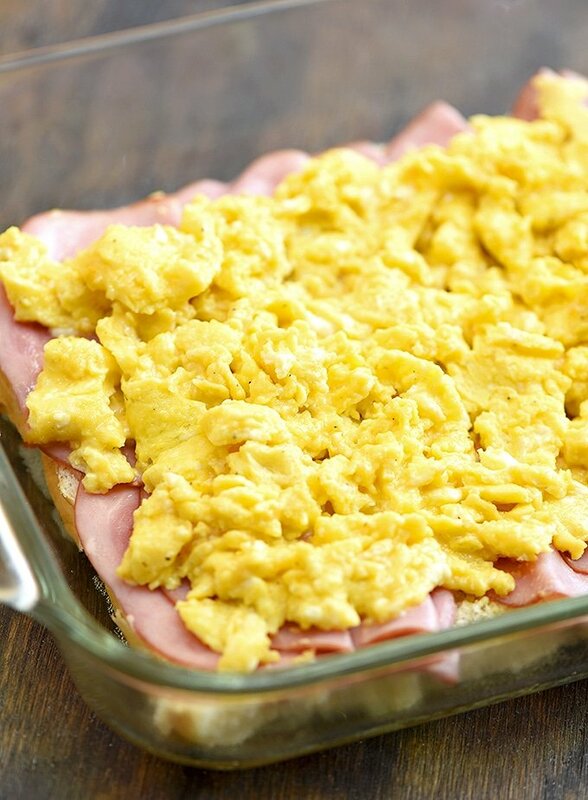 Spoon scrambled eggs evenly over ham. Arrange cheese slices over eggs to cover. In a small bowl, combine melted butter, Dijon mustard, and poppy seeds. Brush over the rolls. Nutritional info calculated at 2 sliders per serving. Recipe adapted from Kraft. You didn’t post the make ahead direction part. Do you prep everything and then not bake, cover and refrigerate? I am going to update the post and include the directions for making it ahead. Yes, you prep everything, cover, and refrigerate. Just bake when you’re ready to serve.